Les Nouvelles de Neuchâtel: Pinch Me. When my elder daughter was in her final year of high school, one of her friends attended Neuchâtel Junior College in Switzerland. Two years later, my son had a buddy who did the same. These experiences barely registered with me at the time; all I knew was that there existed a school in Switzerland that offered a unique learning opportunity for students in their graduating year. A "finishing school" overseas was well beyond the ken of someone who had grown up middle class in Cornwall, Ontario, - although my brother tells me that one of his classmates went there in the late 50's. Clearly, Neuchâtel had been around a long time, but I, busy with the demands of my life, had not been aware of its unique qualities. All this changed three years ago when my former colleague, Susan, told me that a good friend of hers would be working there as Deputy Head of School. On occasion, I would hear about her time there; I discovered that the teachers were generally hired out of Ontario and that the OSS curriculum was taught; I was also told about the many opportunities for travel during the school year. 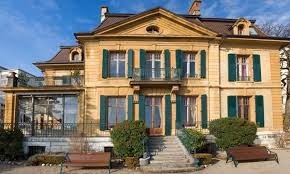 What a lucky woman Susan's friend was to be employed at Neuchâtel! The more I heard about the place, the more intrigued I became. Even though I was retired, I might be convinced to return to the classroom if it were in Switzerland. With my husband's encouragement, I sent my resume in to the principal. Nothing ventured, nothing gained. It has all worked out as I have managed to secure myself a position there this September. I couldn't be happier!! In less than a week, I will journey to Switzerland where I will live for most of the next twelve months. With the exception of my years at University, I have never been away from home for longer than 30 days. This will be an exciting and unique opportunity for me to live and work abroad. This blog is designed to help me capture this special year in words and pictures. I hope you all enjoy it!